MISSOULA — As Jamar Akoh came off the court following his second straight monster double-double, Travis DeCuire met his senior at the scorer’s table. DeCuire pounded on Akoh’s chest and looked Montana’s big man in the eyes, praising him for a performance in which Akoh could not be stopped. In a matchup billed, as it is every season, as the battle of the Big Sky Conference’s two best programs, Akoh won his battle against the league’s other most talented front court. Montana’s first half 20-0 run gave the Griz breathing room early. 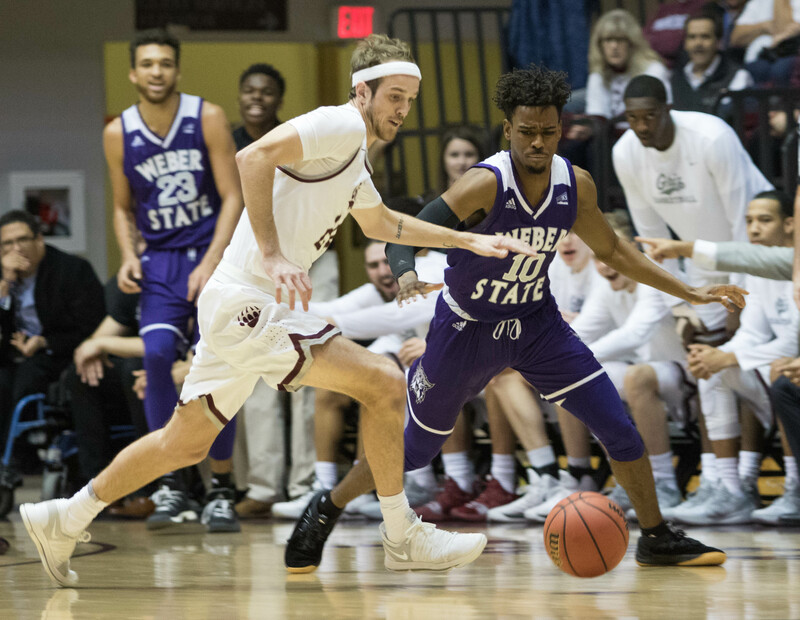 And Akoh’s ability to seal his defender on the block – whether that Weber State defender was senior forward Zach Braxton, league-leading shot blocker Brekkott Chapman or overmatched sophomore Michal Kovak — plus Akoh’s ability to finish at the rim helped the Griz keep the Wildcats at bay. Weber State used three different runs of at least 10 points to whittle what was a 22-point first half lead to a four-point gap late in the game. 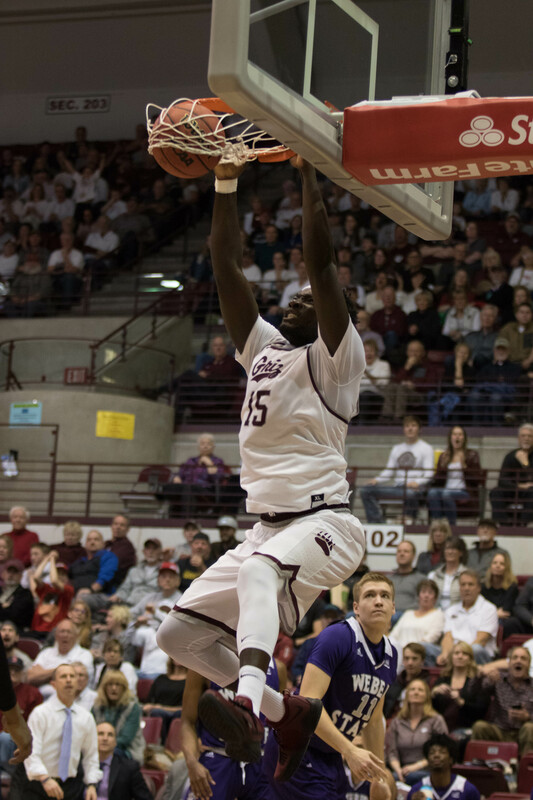 But Akoh kept converting, to the tune of 25 points and 10 rebounds to cap arguably his best Big Sky weekend of his decorated career at Montana. Akoh scored 12 straight points, 17 in the second half and a season-high 25 points overall. 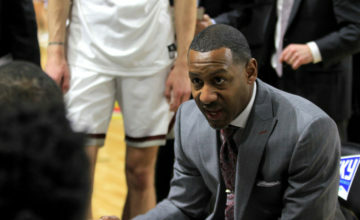 He also grabbed 10 rebounds to lead the Griz to a 75-68 win in front of 5,547 fans at Dahlberg Arena on Saturday night. The win moves Montana to 7-2 in league play, 14-6 overall. UM is now tied atop the conference standings with Weber State, who entered the game having won seven of its eight Big Sky contests. 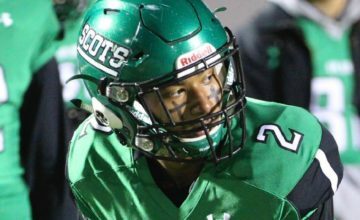 “Jamar is going to get angles and create angle and our offense is built for that type of matchup,” DeCuire said. “Our team is really good at getting the ball from one side to the other. Our terminology is that the defense is always wrong in the post. You are going to guard one way, we will get the ball another way. Akoh scored 22 points and grabbed 17 rebounds in UM’s 80-69 win over Idaho State on Thursday night. 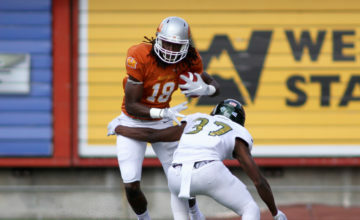 But Weber State’s talented front line presented a different challenge Saturday. Akoh responded, getting both Braxton and Chapman – each 6-foot-9 seniors – into foul trouble. Braxton fouled out, Chapman couldn’t guard Akoh the last few minutes he was in as they both battled foul trouble and Akoh finished 10-of-17 from the floor. Montana lead 51-44 with 12:37 remaining when Akoh started his own personal run. His ability to seal on the back side combined with his soft hands and Montana’s patient passing helped Akoh score three layups, two dunks and earn two trips to the free throw line during the 12 straight points. Akoh averaged 24 points and 13.5 rebounds for the weekend as Montana won for the third straight time. “A lot of teams don’t want to double him because we have so many weapons,” UM senior guard Ahmaad Rorie said. “Tried to just read if someone is fronting him or they are playing behind. We just want to give him good angles to score at. The Wildcats scored 93 points in a nine-point win at Montana State on Thursday night. Chapman hit his first four 3-pointers during a 21-point night in Bozeman. Jerrick Harding poured in 19 of his 26 points in the second half as WSU held on after building a 32-16 lead midway through the first half. 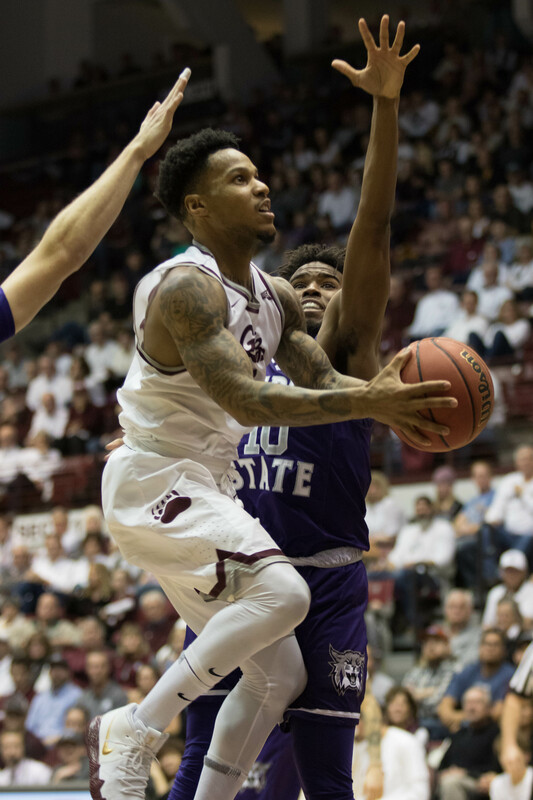 On Saturday, Montana smothered the smooth-shooting Wildcats completely during an eight-minute stretch in the first half. UM forced WSU into 10 straight misses. The stretch also included five turnovers and the visitors did not score for eight minutes, 35 seconds. The Griz scored 22 straights during the stretch to take a 32-10 lead. But Weber answered with a 10-0 run and closed the half down 40-26. Weber State also mounted runs of nine and 11 straight points after halftime. 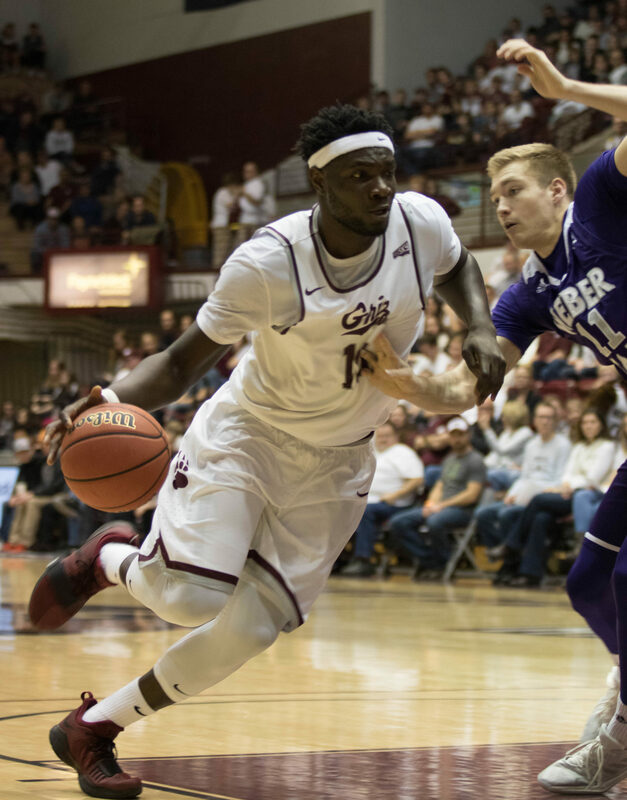 But the deficit and Akoh’s dominance in the second half helped Montana hold on for its 11th win in the last 12 games between UM and Weber State in Missoula. Harding scored 11 points in each half, including a half-court heave at the first half buzzer. But Montana made the slashing Weber guard work for all his points, mainly assigning 6-foot-7 senior Bobby Moorehead to disrupt Harding’s flow. Chapman missed his first seven shots and battled foul trouble throughout. He and Braxton converted two field goals each. Braxton, who played just 24 minutes because of foul trouble, finished with three rebounds but Chapman, the league’s leading rebounder, finished with 16 boards. The Wildcats shot 57 percent after halftime but lost for the second time in league play this season. On one hand, Montana led a 22-point lead shrink to two possessions. On the other, the Wildcats fought tooth and nail despite not having any answer for Akoh. UM senior Michael Oguine played 26 minutes, scoring seven points and grabbing three rebounds two days after missing the Idaho State game with a bone bruise in his back, according to Akoh. WSU limited Rorie to 13 points on 6-of-14 shooting. Junior Sayeed Pridgett scored 12 points but it took him 11 shots to get there. The Griz finished 5-of-17 from beyond the arc. But the Griz ripped off a string of stops in the first half and steadily held on in the second for the signature league win of this season so far for the reigning Big Sky champions. With 11 regular-season and at least one Big Sky Tournament games remaining, the Grizzlies turn their attention to their first rivalry matchup of the season. UM will gun for its fourth straight and 14 of the last 15. Montana’s 90-63 win in Missoula last February marked the second-largest margin of victory in the history of the 117-year rivalry. It also gave UM its 149th win in the series compared to 148 wins for Montana State. The Griz lead the series for the first time in a rivalry that goes back to 1902. Photos by Jason Bacaj. All Rights Reserved.